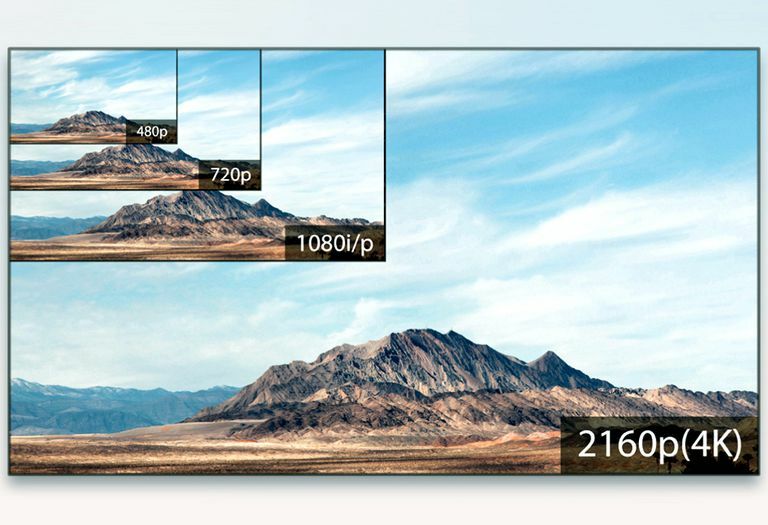 4K refers to one of two high definition resolutions: 3840 x 2160 pixels or 4096 x 2160 pixels. 4K is four times the pixel resolution, or twice the line resolution (2160p), of 1080p (1920 x 1080 pixels). The other high definition resolutions in use are 720p and 1080i. These are the resolutions most frequently used in larger screen televisions to create better detailed pictures. 4K resolution is used in commercial digital cinema using the 4096 x 2160 option, where many films are shot or mastered in 4K by upscaling from 2K (1998 x 1080 for the 1.85:1 aspect ratio or 2048 x 858 for 2.35:1 aspect ratio). Under its two official consumer labels, Ultra HD and UHD, 4K is well established in the consumer and home theater landscape, using the 3840 x 2160 pixel option. In addition to Ultra HD or UHD, 4K is also referred to in professional settings as 4K x 2K, Ultra High Definition, 4K Ultra High Definition, Quad High Definition, Quad Resolution, Quad Full High Definition, QFHD, UD, or 2160p. What makes 4K resolution significant is that with the use of ever larger TV screen sizes as well as video projectors, it provides much more detailed and less pixel visible images than 1080p. 1080p looks great up to about 65-inches, and can still look good in larger screen sizes, but 4K can deliver an even better-looking image as screen sizes continue to increase. The resolution remains constant regardless of screen size. However, as the screen gets larger, what does change is the number of pixels per inch. This means that pixels need to be increased in size, and, or spaced farther apart in order to maintain the same number of pixels on the screen. There are plenty of 4K Ultra HD TVs available, as well as a growing number of 4K and 4K-enhanced video projectors. For added support in home theater setups, most AV home theater receivers have either 4K pass-through and/or 4K video upscaling capability. 4K content is available from several streaming sources, such as Netflix, Vudu, and Amazon, as well as via the Ultra HD Blu-ray Disc format and players. Although there are many Blu-ray disc players that upscale standard 1080p Blu-ray disc to 4K, only an Ultra HD Blu-ray Disc player can play discs that contain a native 4K resolution. On the satellite part of the equation, DirecTV and Dish are able to deliver a limited selection of pre-recorded and live 4K content via satellite to its subscribers (provided they have both a compatible satellite box, compatible TV, and subscribe to the appropriate plan). For those that prefer accessing content via cable, your choices are definitely limited. So far, Comcast provides a limited amount of 4K live and on-demand programming, plus access to 4K Netflix. If you have a 4K Ultra HD TV, check with your local cable provider to see if they offer any compatible 4K service. Over-the-air TV broadcasting is where 4K implementation is lagging. Although South Korea and Japan have taken the lead with regular 4K TV broadcasts, it is still being field tested in the U.S. to iron out issues such as compatibility with the current broadcast system and added infrastructure costs that stations will need to incur. The U.S. 4K TV broadcast system being tested is referred to as ATSC 3.0 (NextGen). The increasing availability of 4K delivers consumers a greatly improved video display image for larger screen applications, and can greatly reduce the ability for viewers to see any visible pixel structure on the screen unless you place yourself extremely close. This means even smoother edges and depth. When combined with faster screen refresh rates, 4K has the potential to deliver almost as much depth as 3D — without the need for glasses. The implementation of Ultra HD doesn't make a 720p or 1080p TV obsolete, although, as 4K Ultra HD TV sales pick-up and prices come down (you can find some 50 and 55-inch Ultra HD TVs for less than $500), fewer 720p and 1080p TVs are being made. Also, the current HDTV TV broadcast infrastructure will not be abandoned anytime soon, even as ATSC 3.0 begins to be used for content transmission. Of course, just as with the 2009 DTV transition, there may come a date and time certain where 4K may become the default TV broadcast standard, but that means a lot of infrastructure needs to be in place. What lies beyond 4K? How about 8K? 8K is 16 times the resolution of 1080p. There are a limited number of 8K TVs available for purchase by U.S. consumers, with Samsung taking the lead, but there is no native 8K content available to watch in the U.S. This means that for some time viewers will be viewing images on 8K TVs that are upscaled from 4K, 1080p, 720p, or other lower resolution. However, Japan has started broadcasting one channel of 8K content. 1080p (1920x1080) is 2.1 megapixels. Only with 8K (7680 x 4320 pixels – 4320p) do you get into the pixel resolution range of the best professional digital still cameras – 33.2 megapixels. You are most likely taking photos with much higher resolution than you can see on your TV screen when it comes to video content. Of course, all the above being said, you are the one that needs to be satisfied with what you are seeing on your TV screen — increased resolution is one part, but other factors such as video processing/upscaling, color consistency, black level response, contrast, screen size, and how the TV physically looks in your room all need to be taken into consideration.